Potatoes are everyone’s favourite. Baked, boiled, fried or steamed they can be an excellent accompaniment to a dish or as a main dish. Used in stews, curries, soups, salads, breads etc. The humble potato is truly a versatile vegetable. 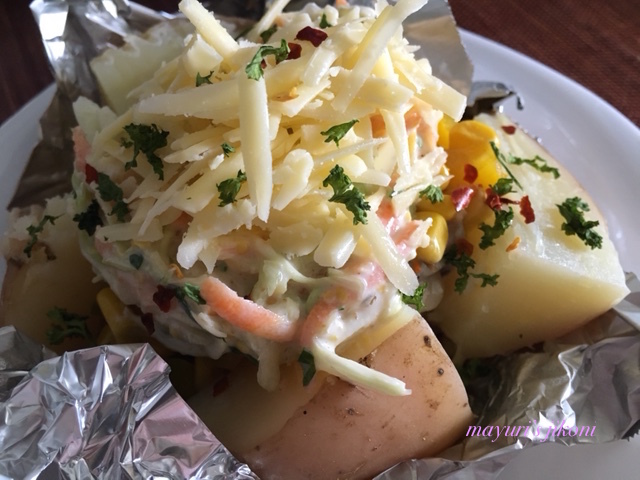 Today I am going to share my favourite recipe, baked potato or jacket potato. For this you need the nice flaky or powdery types of potatoes. In UK they sell potatoes just for baking and in Kenya I prefer to use the Meru potatoes. Unfortunately in India the potatoes do not bake too well. So they have to boiled first and then baked for while before stuffing them. I have written about just a few of the stuffings that I use for baked potato but you can use anything that you wish. Its an excellent party idea. Have loads of baked potatoes ready and keep all sorts of stuffings ready. The guests can top the potatoes with their favourite stuffing. Scrub the potatoes thoroughly. Pierce them all around with a knife. Wrap each potato with a tin foil piece. Place them on a baking tray and put them in the oven to bake. Bake for 25 to 30 minutes. They are done when you can pierce a knife into it easily. While the potatoes are getting ready, prepare the stuffing and sauce. To prepare the mushroom stuffing, heat the oil in a wide pan. Saute the garlic for 30 seconds or so. Add the mushrooms and herbs. Stir fry on high heat for 2 to 3 minutes. Take the pan off the heat. Let the mushrooms cool down a bit before you add the salt and pepper. Mix well. To prepare the corn stuffing, Heat oil in a pan. Stir fry the onions till they become light pink in colour. Add the chopped pepper and cook for a minute or so. Add the sweet corn, salt and chilli flakes. To prepare the sauce, heat oil in a pan over low heat.. Add flour and stir it till it becomes light pink in colour. Take the pan off the heat, add the milk and keep on stirring. Put the pan back onto the heat and keep stirring till the sauce becomes thick. Add salt and pepper. To serve, cut each potato halfway into quarters. Sprinkle some salt on pepper onto it. Add a dollop of butter. Top the potato with the stuffings, sauce,coleslaw and grated cheese and serve. Make sure the potato, sauce and stuffings are hot. Make your own coleslaw or follow my recipe for eggless coleslaw. Use tomato sauce instead of white sauce.For a home made tomato sauce refer to my recipe vegetable crepes. Cut paneer into tiny cubes and stir fry with ginger, garlic and chillis and use as a stuffing. Or use paneer tikka as a stuffing. Baked beans are excellent with baked potatoes. Just warm the beans up. Spinach and feta stirred with garlic is another option. Use sour cream instead of white sauce.